Forearm pain is any discomfort, soreness or pain in the part of the arm lying between the elbow and wrist. It may occur on its own or be present with arm pain as a whole, elbow pain, wrist pain, hand and finger pain. The pain may only be present when moving the forearm, hands or fingers since many of the muscles of these neighboring parts are located within the forearm. Alternatively, the pain may be present and persist even when the forearm is stationary. Sometimes forearm pain is not due to any problem within the forearm or neighboring structures. Instead it emanates from the root of the spinal nerve with pain been felt along the course of the nerve down the upper arm and forearm to the hands and fingers. It is important to first understand the anatomy of the forearm as any disease, disorder or injury of these structures may be the reason for forearm pain. The forearm is the area that lies between the elbow and the wrist. 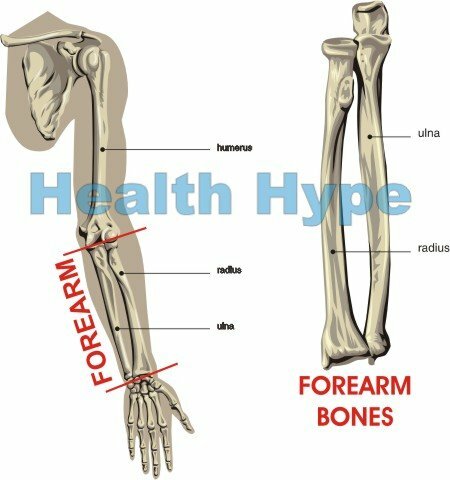 It has two long bones known as the ulna and the radius. Both these bones are a joined by a thin but very strong interosseus membrane. That radius and ulna have a long body called the shaft with the head of the ulnar lying towards the wrist and the head of the radius located at the elbow. There are several joints – between the radius and ulna and between these bones and the humerus in the elbow or the carpal bones at the wrist. This allows for the degree of flexibility in the forearm where it is able to twist inwards or outwards in movements known as pronation and supination and the bending and straightening of the forearm known as extension and flexion. The radius and ulna articulate with each other at two points – the proximal radioulnar joint (PRUJ) and the distal radioulnar joint (DRUJ). Various ligaments serve to hold the bones and structures of these joints in place thereby adding strength and support. The groups of muscles that therefore carry out these movements are therefore known as the flexors, extensors, pronators and supinators. Long tendons running as far down as to the digits allows for the different movements of the hand and fingers despite the muscles being located in the forearm. Vessels in the forearm which supplies its with blood and also supplies the hand and fingers. This includes the radial and ulnar arteries and of the cephalic, median antebrachial and basilica veins. Alongside these blood vessels lie the lymphatic vessels and lymph nodes. The video below provides an overview of the assessment of forearm pain by a medical practitioner in an attempt to diagnose a possible cause. Falls either striking the ulnar and radius directly or use the hands to break a fall. Twisting the arm beyond its normal range of motion. Blow to the forearm in instances of accidents or falls. Sharp force injury which may sometimes be defensive wounds when the forearm is used to shield the body. In instances where the force of the injury is severe enough, it may cause a fracture of the bone. Either the radius or ulna may be fractured or sometime both bones together which is then known as a radioulnar fracture. Some of the common sites of a fracture include the shafts of both bones, head of the radius and olecranon of the ulna involved in the elbow joint. Tenosynovitis is the inflammation of the tendon sheath. It is more likely to occur in the forearm since some of the longest tendons start here and extend all the way to the finger. Medial epicondylitis is inflammation of the tendons that attach to the medical epicondyle of the humerus at the elbow. It is commonly known as golfer’s elbow. Lateral epicondylitis (tennis elbow) is inflammation of the tendons that attach to the lateral epicondyle of the humerus. Although there are several different types of arthritis which can affect almost any joint in the body, it is osteoarthritis there is most likely to lead to forearm pain. In this type of arthritis, the articular cartilage at the end of the bone becomes eroded over the time usually as a result of wear and tear. This erosion may eventually expose the underlying bone which can then become damaged. Osteoarthritis of the elbow is one of the possible causes of the forearm pain as well as osteoarthritis of the hand. Rheumatoid arthritis may be seen in the wrist and in the small joints of the fingers. Septic arthritis can affect any joint if microbes enter the joint space usually after an injury with a break in the skin. Cervical neuropathy is any disorder in the cervical spinal nerves. The more common causes are nerve root compression (pinched nerve). It can cause referred pain to the arm, forearm, hands or fingers. It is usually when C5 and C6 or C6 and C7 are affected that forearm pain may be present. Carpal tunnel syndrome is where the median nerve becomes compressed on its way from the forearm to the hand as a result of inflammation of the tendons running through the carpal tunnel. It mainly causes wrist, hand and finger pain with varying degrees of forearm pain at times. Ulnar neuropathy is a term for any problem with the ulnar nerves. The two more common causes apart from nerve damage with an injury to the forearm includes ulnar tunnel syndrome at the wrist and ulnar nerve entrapment at the elbow. It is the latter, ulnar nerve entrapment at the elbow, that is more likely to cause forearm pain while ulnar tunnel syndrome may present with wrist, hand and finger pain. Although problems with the blood vessels leading to forearm pain is uncommon compared to the disorders with the other structures mentioned above, it should be taken into consideration. Peripheral embolism is where a blood clot (or any other tissue or object in the blood vessel) partially or completely obstructs the blood flow to the forearm, hand or fingers. Acute limb ischemia is damage to the tissue of the forearm as a result of an interruption to the blood supply. It is more likely to occur with a blood clot or tourniquet that is left in place for long periods of time. Narrowing of the brachial artery or its branches (radial and ulnar artery) may also compromised blood flow to the arm thereby leading to ischemia. Thrombophlebitis is an inflammation of the blood vessel of the forearm usually due to an infection which may occur after an injury with a break in the skin or the use of unsterilized needles. Lymphangitis which is an inflammation of the lymphatic vessel may also lead to localized forearm pain and tenderness with a red streak on the overlying skin where the vessel lies.